The Brazilian premium automobile market is highly promising and also a very competitive market. However, it’s a challenge for car manufacturers to draw their audience into dealerships and initiate the sales process. The sequence of a traditional advertising campaign is: automakers firstly launch new models, wait for potential customers to visit their stores and appraise their current vehicles, and only then provide the trade-in conditions for the manufacturers’ new models. Luxury consumers want to feel they are exclusive and they overestimate the price of imported models. Due to Brazil’s high importation taxes, people believe Audi models are much more expensive than they actually are. Therefore, we had to show to potential customers the prices of the new Audi models and that they were within their budgets. A RFID tag was placed on each car’s back window containing all information collected by the Audi employee. When the driver drove through the exit gate, the antenna would capture the data on the RFID tag, prompting the billboard to instantly display an exclusive, tailor-made offer for that specific car and driver. To take advantage of the offer displayed on the panel, the driver simply had to go to the nearest Audi dealership. Audi is renowned around the world for being a prestigious brand that offers high-tech features. We combined technology and prestige into a service that not only broke the price perception paradigm. We created an innovative and customized digital service that makes the path to purchase easier, surprising consumers. During the period of the campaign, the amount of consumers who visited an Audi dealership increased by 45%. More than 6000 vehicles were evaluated every day and 15% of the audience decided to change their used car for a new Audi. Additionally, this service generated spontaneous media and became a talking point on national and international news. Ruffles, a PepsiCo brand, launched a national competition in Brazil entitled “Ruffles: please do me a flavour”, which allowed consumers to create new crisp flavours. The three most voted for flavours were produced, launched in Brazil and winners won 1% of the product sales. PepsiCo partnered with BBDO to develop ways that Ruffles (a brand in the daily routine of Brazilian teenagers for more than 30 years) could refresh their tone of voice to reach the new generation. The challenge was to identify what type of content Generation Z was interested in to define the tone of voice of the brand to launch the competition. A user-driven approach was proposed to track real teenage behaviour, using real life data such as analysis of content of their favourite TV shows, movies, music and even Youtube channels and videos. Aside from internal tools, desk research and qualitative interviews with parents, outside resources were possible to include due to the relationship I have built over time with technology partners such as Google. Different partners were connected and sources of quantitative databases were used to analyse all data to direct the qualitative content analysis. Therefore, we were able to discover teenagers interests and articulate insights that informed and inspired the creative team to produce relevant content to teenagers. The output of this analysis was a simple word cloud that was able to translate the quantitative and qualitative input to inspire the team. 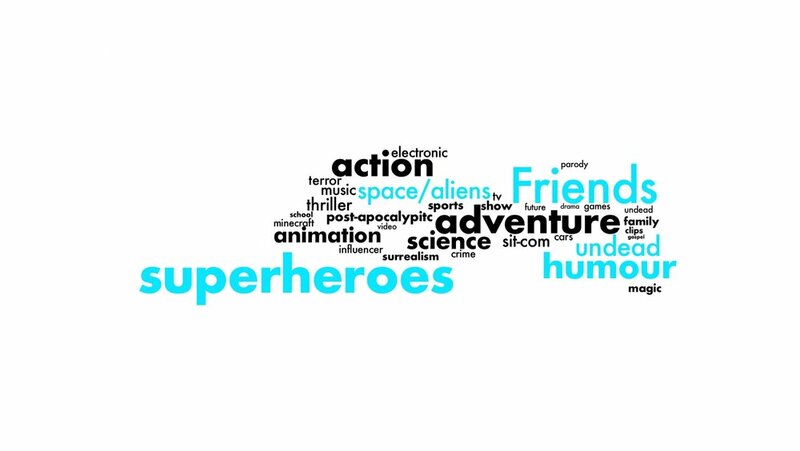 The size of the word indicates how important the subjects were and helped the creative team to prioritize creative approaches. We were able to influence the content produced by the creative team, and extraterrestrials and 'undead' characters were used showing their friendship with Ruffles consumers with a sense of humour. Using the right tone of voice, Ruffles was able to get closer to the new generation, which has encouraged them to co-create a new flavour for the crisps and impacted positively on the sales of the product. 102,778 people have registered their new flavour and 231,194 people voted for their favourite options between three top ranked options: Burrito, Feijoada (a traditional Brazilian dish) and the winner, Calabrese. It was a great experience connecting unexpected partners and different databases, using a user-centric approach. The team had fun with the discoveries, learning how to connect the dots and balance criteria from different sources. I have always had a strong interest in creative processes. 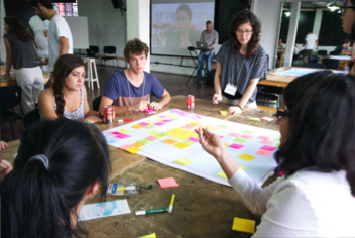 I took an “Ideas Course” at the University of Arts (London) and a one-year Service Design course at a school created by Livework founders in Brazil in 2012. Since then I started to apply the Service Design mindset and tools in my daily routine to develop strategic thinking to global brands such as Volkswagen, Visa, Pepsi and Mars. When I started to work at BBDO Sao Paulo (full-service ad agency) as an Insights/Connections Planning Coordinator, the challenge of the area was: How to leverage the area in order to increase the strategic and creative relevance within the company, integrating teams across floors and disciplines? With that in mind, our goal was to start designing a human-centric approach for the communication planning and stop considering only the traditional way of thinking (e.g. demographic). By that time, my study background in Service Design was fundamental to re-thinking the process and establishing new connections across multidisciplinary teams. By that time we raised our relevance introducing the strategic thinking such as Persona, Blueprints of path to purchase journey, sector and trends analysis, qualitative research focused on media channels and even concept tests for campaigns. I lead the process to implement the co-creation workshops based on the Design Thinking methodology (internal with interdisciplinary teams and external with clients) and multiple training about Design Thinking, Service Design, Digital and Innovation culture based on existing online courses such as Design Thinking (Stanford, NovoEd) and international travel such as San Francisco where I visited innovative places like IDEO, AirBnb, IBM Design studio, d.school, Facebook, Google and Rainbow Mansion. Also, I built a solid relationship with key technology and media partners to provide Insights from exclusive sources and I was selected to be one of the Digital ambassadors in the company for digital insights using tools such as social media listening, Facebook, all Google tools, ComScore and Online surveys. Touchpoint’ strategy started to be developed based on the human-centric approach and ideas started to be generated based on the service design mindset. The area started to be considered relevant and teams felt confident to involve us in every briefing/pitch to contribute with creative insights and defend ideas rationally to clients. Most important, our deliveries became part of the full process of the agency once we had impacted positively on traditional ways of thinking. In addition to a few awards, I was promoted to Insights Supervisor in a year and I was invited by renowned schools, universities and events in Brazil (such as Universidade de São Paulo and The Developers Conference) to talk about my experience of disseminating the culture of innovation in an ad agency. Amplify Creative Communities was initially started by the DESIS Lab within Parsons The New School of Design in New York City. This project provides a platform to expand community initiatives that develop more positive ways of living and working. The Brazilian version, Amplifica Pompeia, began in 2013 as an integral part of the 10th São Paulo International Architecture Biennale, which was a result of a partnership among Parsons, Biennale, SESC Pompeia and Hivelab - School of Service Design. Our challenge was to enter Vila Pompeia, a traditional neighborhood in São Paulo where a large number of factories settled out, and discover an array of urban activists working to improve lives and build sustainable futures. Thus, it could provide a space for people to express their major concerns regarding the city and encourage them to take action. We visited over 30 community initiatives in the region and selected 12 that came from within the community, were collaborative and had a positive impact on society. Based on rigorous observations and in-depth interviews with members of the initiatives, we organized them into 4 themes and produced videos to tell the stories. It was essential to provide a space for people to express their major concerns regarding the city, and then encourage them to take action. Every week a new question was displayed on a board at the exhibition and people were invited to write their answers on post-its and share them on the board. In addition, two workshops were also held inviting visitors to engage using design thinking tools to create proposals for urban issues like urban mobility and sustainability in small groups that could be immediately applied. We knew that there were other inspiring projects currently taking place that we missed. So, as part of this project, an interactive map was created and people participated by writing down on cards how such initiatives transform urban life, and placed them on a map. After the exhibition, a new map was created on Google Maps with all the initiatives. Amplify Creative Communities provided a platform to expand community initiatives that develop more positive ways of living and working. By disseminating collaborative initiatives that result in new and sustainable lifestyles, the project inspires individuals to adopt transformative examples. TETO is a non-profit organization in Latin America that was created in Chile and aims to overcome the extreme poverty situation in which very precarious communities have millions of people living. Our challenge was to map key communities to start working closer with those individuals who dreamed together for better life conditions, who refused to accept the existing poor conditions and then decided to take action, creating new spaces and opportunities. Families living in most precarious conditions are chosen and emergency homes are built for them. TETO work is divided into 3 phases: 1) know the community and build emergency homes 2) accompany families 3) co-create and implement social development with the locals. I have trained and lead a team of 10 people to apply a 2 hour questionnaire co-created with the Brazilian Institute of Geography and Statistics (IBGE) across 50 households in a poor community in São Paulo in 2 days and also helped to build 5 emergency houses, leading the process of 3 of them. When constructions were completed, visits were organized to follow the evolution of the family. It means to check, for instance, if all are working or if children are going to school. Emergency homes are an excuse to enter the community, once the non-governmental organization gains the trust and cooperation of residents, a social development plan is co-created and implemented together with the locals. My personal learning was to have a hands on experience, acting as a transformation agent and see the evolution of some families that I have worked closely with.